Little is known of the larval biology of Pacific lamprey (Entosphenus tridentatus), a species of conservation concern. With miniaturization of passive integrated transponder (PIT) tags, researchers now have the potential to individually mark larval lamprey. However, recent studies with sea lamprey (Petromyzon marinus) ammocoetes indicated that mortality was unacceptably high after surgical implantation of these tags. We examined survival, tag retention, growth, and swimming performance of Pacific lamprey ammocoetes tagged with uniquely coded 8.4-mm PIT tags and controls marked with visible implant elastomer (VIE). Ammocoetes as small as 71 mm in length were PIT-tagged. Of the 99 PIT-tagged individuals, four died (4%) and two lost their tags (2%) within 2 months of tagging. In this period, controls had 5% mortality and 15% VIE mark loss. Incisions were completely healed within 3 months of tagging, and mean specific growth rate during this period did not significantly differ between treatment groups. Ammocoetes bearing a PIT tag did not exhibit significant reductions in swimming performance relative to controls. We attribute the success of this tagging effort to changes in tag implantation technique, including use of a lateral incision and no sutures. The ability to individually mark wild larval lamprey will allow research on individual growth rates, environmental effects on growth and metamorphosis, timing and rates of movement, and, ultimately, stage-specific survival. Larval lamprey (ammocoete) biology and ecology are poorly understood , in part due to the paucity of information on such basic topics as individual growth rates in nature, growth variation, range and timing of movements, and responses to environmental change. This information is needed for understanding and management of this group of fishes, particularly in light of the fact that many lamprey species are of conservation concern [2, 3]. One reason for these knowledge gaps is that ammocoetes burrow into the sediment and have small body size, making field experiments and tag–recapture studies difficult. After hatching in freshwater streams or rivers, ammocoetes burrow into silty sediments and assume a filter-feeding existence for up to 7 years . During this time, their length ranges from 10 to 200 mm, and their worm-like body form does not lend itself to external tag attachment. While batch elastomer implants and coded wire tags have been successfully used to tag ammocoetes [4–6], uniquely coded tags would allow determination of individual growth rates and movement patterns [7–10]. Passive integrated transponder (PIT) tags identify individuals and show promise for elucidation of ammocoete behavior and biology. A number of studies have used 10- to 12-mm PIT tags to individually mark relatively large (>120 mm) metamorphosed Pacific lamprey Entosphenus tridentatus [11–13]. Large (>120 mm) sea lamprey Petromyzon marinus ammocoetes have also been marked with these PIT tags to examine movements and distribution in the field . With the recent miniaturization of PIT tags to reduce both length (to 8.4 mm) and diameter (to 1.4 mm), unique marking of very small (<120 mm) lamprey is now possible . However, in the Laurentian Great Lakes, initial studies to implant these tags in sea lamprey ammocoetes resulted in high mortality rates for animals smaller than 120 mm . Tag loss and effects of 8.4-mm PIT tagging on small ammocoetes have not been evaluated for Pacific lamprey, a species of conservation concern. All tagging studies rely on the assumption that fish health and behavior are not affected by the tag or handling associated with tagging. However, the literature is replete with examples of tag effects on survival, growth, swim performance, buoyancy, feeding, and predator evasion (reviewed in [14–16]). While miniature PIT tags are small enough to fit in the ammocoete body cavity, Dawson et al. 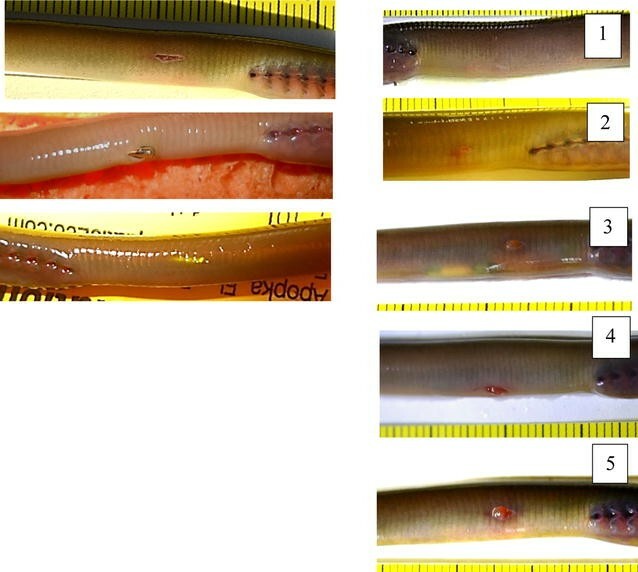 found that implantation with a ventral incision and sutured closure resulted in internal injuries and eventual death in most (60%) sea lamprey ammocoetes that were <120 mm in length. Tag loss was also unacceptably high (5%). Ammocoetes may be particularly sensitive to tagging effects and/or tag shedding because they live in sediment and are readily exposed to pathogens or wound abrasion. In addition, an internal tag may block their alimentary tract and affect digestion and elimination. Ammocoetes need to move rapidly and burrow successfully to survive. Their anguilliform movements can facilitate tag loss, and their relatively thin skin and lack of scales may contribute to eventual tag extrusion [10, 13]. Finally, metamorphosis in lampreys involves profound morphological, physiological, and behavioral changes that must not be interrupted or delayed by the presence of a tag . We assessed tag loss and the effects of PIT tagging on larval Pacific lamprey, a species of great cultural and ecological significance in the northwestern USA . In particular, we wanted to determine whether implantation using a lateral incision (through the body wall on the side of the fish rather than ventral) without sutures would result in lower mortality and tag loss than that observed by Dawson et al. in their experiments with similarly sized sea lamprey ammocoetes. Dawson et al. noted that the surgery was complicated by damage to the ammocoete intestine during tag insertion. By trying a more dorsal incision location and forgoing sutures, we hoped to reduce the extent of injury during surgery. In addition, we tested the null hypothesis that after recovering from PIT tagging, Pacific lamprey ammocoetes bearing an 8.4-mm tag would not experience reduced growth or restricted swimming performance relative to controls. The ultimate goal of this study was to establish size limits for tagging Pacific lamprey using the newest generation PIT tag. Ammocoetes were electrofished from the upper Umatilla River on November 25, 2013. They were induced to emerge from the sediment by delivering a 125 V, 4–20 amp, direct current using a 25% duty cycle, AbP-2 backpack electrofisher (Department of Engineering Technical Services, University of Wisconsin, Madison, WI) at a pulse rate of 3/s. A pulse rate of 30/s was used thereafter to stun ammocoetes for dipnet capture. Captured ammocoetes were transported to the laboratory (Water and Environment Center at Walla Walla Community College) in a cooler and supplied with oxygen. Ammocoetes larger than 70 mm (n = 119) were selected for the tagging experiment and tagged on November 25–26, 2013. All fish were anesthetized using 75 mg/L buffered tricaine methanesulfonate (MS222), measured (mm), and weighed to the nearest 0.1 g. Surgical tools were disinfected (chlorhexidine) and handling methods followed Wargo-Rub et al. and U.S. Geological Survey Institutional Animal Care and Use Committee Permit 2008-26. For PIT tagging, a 3-mm fixed-depth scalpel was used to gently open a 3-mm incision at about the 13th myomere, approximately 12 mm posterior to the gill slits. For most fish, the incision was made laterally, but we also tried a ventral incision on 21 individuals (Fig. 1). A disinfected 8.4-mm PIT tag (1.4 mm diameter, 0.034 g, Biomark HPT8) was gently inserted into the body cavity, and the incision was not closed with sutures or any other method, as described by Mesa et al. . Controls were marked at the same location (approximately 12 mm posterior to gill slits) by injecting a 2-mm streak of uncured yellow VIE (Northwest Marine Technology, Inc.) under the skin (as in ). Use of elastomer with the hardener added would not have increased tag retention, as noted by a similar study of long-term VIE marking with Pacific lamprey ammocoetes . Immediately after tagging, experimental fish were transferred to field (Minthorn Springs, a tributary of the Umatilla River in northeastern Oregon) and laboratory (Water and Environment Center at Walla Walla Community College) holding facilities. For the field setting, both PIT-tagged (15 with ventral incisions) and control fish were held in the same tank (0.6 × 0.7 × 1.1 m) on the stream bank. The insulated plastic tank had a solid lid and received ambient Minthorn Springs water (6–11 °C in winter) pumped at a rate of approximately 4 L/min. Fine sediment and organic debris from the adjacent stream were added to the tank to provide approximately 15 mm substrate depth. These fish did not receive supplemental feed. At the laboratory, PIT-tagged (6 with ventral incisions) and control fish were loaded into six 11-L polycarbonate tanks with 15-mm-deep substrate of 149–595 µm sterilized sand. No more than two controls were in each tank to permit identification of individuals. Each tank received recirculated, UV-irradiated, and dechlorinated city water at a rate of 0.6 L/min. Temperature was maintained at 14 °C (±2 °C) throughout the experiment. This group was fed weekly with a diet of 40 mL concentrated (2–7 billion/mL) marine algae cells (Nannochloropsis 3600 and Pavlova 1800, Reed Mariculture Inc.) and 5 g larval fish food (larval diet AP100 < 50 µm Zeigler feed). Ventrally tagged fish were held in the same tanks as laterally tagged individuals. The sediment surface was checked daily for mortalities, and any dead lamprey were necropsied. Healing and tag retention for both tagged and control fish were assessed approximately monthly starting on December 10–11, 2013, and ending on September 30, 2014. Incision healing was scored on a scale from 1 to 5 (Fig. 1), with completely healed incisions having no infection or inflammation scored as a 1. Incisions with tissue completely apposed but still showing some sign of redness were scored as a 2, while those with tissue only partially apposed were scored as a 3. Incisions with tissue not apposed and showing no sign of healing were scored as a 4, and those that had not closed at all and had signs of inflammation or infection were scored as a 5 (Fig. 1). Ventrally tagged and laterally tagged fish were evaluated using the same scoring system. A Chi-square test was used to compare the percentage of completely healed fish (scored as 1) for the field and laboratory facilities at 15 and 51 days after tagging. Analysis of variance (SAS9.3, SAS Institute, Cary, NC) was used to determine whether there were significant differences in starting weight between the two treatment groups (PIT-tagged and control) held at the two sites (field and laboratory). Analysis of covariance (SAS9.3) was used to compare specific growth rates of the two treatment groups at each site, where fish length at the start of the experiment was used as a covariate. Approximately 9 months after tagging, swim tests were conducted at the Pacific Northwest National Laboratory Aquatic Research Laboratory (PNNL), Richland, Washington. This work was conducted under the “Routine care and maintenance of general aquatic laboratory fish stocks” protocol maintained by the Association for Assessment and Accreditation of Laboratory Animal Care International. A subsample of ammocoetes from the field site was transported in a cooler to PNNL and held in two 37-L aquariums supplied with Columbia River water. A 5-cm layer of fine sediment was placed in each aquarium to provide burrowing medium. Fish were held at the laboratory for ~1 month prior to testing and were fed yeast weekly at a rate of 250 mg/L. Trials were conducted during August and September 2014. Lamprey were transferred from aquaria by dip netting and placed in a 2-L pitcher and then transferred to the test chamber. Trials were conducted using the same flow-through river water source used during holding. Water temperature during all trials was 16.0 °C (±0.2 °C). Swimming performance was tested in a Blazka-type respirometer constructed from a clear plexiglass tube (122 cm long × 9 cm inner diameter) with a 0.75-hp electric motor (Fig. 2). The swimming area within the tube was 9 by 43 cm. The relationship between water velocity in the swim chamber and motor speed was determined using a stainless steel pitot tube (United Sensor Corp., Amherst, New Hampshire) and modeled using linear regression. 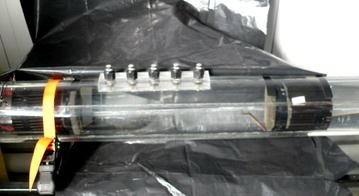 Flow straighteners at the upstream end of the tube were used to achieve uniform water velocity within the swim chamber. An electrifiable grid was in place at the downstream end of the swimming area. A black plastic shade was placed along the side of the swim chamber to reduce disturbance and optimize viewing. All test trials were videotaped and recorded using a CCTV CSP-750IR24 infrared bullet Sony security camera connected to a CCTV 960H digital video recorder. For sustained swimming tests, swim speed for each test was randomly chosen from one of three treatments: 5, 6, or 7 cm/s. A randomly chosen lamprey was installed in the swim chamber and allowed to acclimate at no flow for 15 min. Water velocity was then increased to the treatment speed and the trial was continued until the lamprey was exhausted (would not swim after two electrical stimuli). Total swim time was recorded at the treatment velocity for 15 PIT-tagged fish and eight controls. Fish were tested twice, with a 15-min recovery time between trials. Analysis of covariance (SAS9.3) was used to assess the effects of tag treatment (PIT-tagged and control), trial (first and second), and swim speed treatment (5, 6, or 7 cm/s) with individual fish weight used as a covariate. Critical swimming speed (U crit) was determined for a subsample of five PIT-tagged fish (79–119 mm) at least 2 weeks prior to sustained swim trials. Each individual was installed in the chamber and allowed to acclimate for 15 min. Water velocity in the chamber was then increased to 5 cm/s for 1 min or until the lamprey was impinged and received an electrical stimulus two times. After successful completion of swimming at this speed, velocity was increased to 6 cm/s for 1 min or until the lamprey was impinged and received an electrical stimulus two times. This sequence was continued until the lamprey was exhausted and the time at each swim speed was recorded. Critical swimming speed (cm/s) was calculated using the formula described by Beamish . At the start of the experiment (November 25, 2013), mean total length (TL) of PIT-tagged ammocoetes was 112.4 mm at the laboratory (n = 34, range 87–145 mm) and 91.4 mm at the field site (n = 65, range 71–115 mm). Mean TL of control ammocoetes was 105.6 mm at the laboratory (n = 7, range 79–128 mm) and 91.4 mm at the field site (n = 13, range 71–113 mm). Mean weight of PIT-tagged fish before tagging was 2.24 g (SD = 0.75) for fish held in the laboratory and 2.05 g (SD = 0.56) for fish held in the field. Mean weight was 1.18 g (SD = 0.77) for control fish held at the laboratory and 1.16 g (SD = 0.46 g) for those held at the field site. Based on analysis of variance, starting weights for fish held at the laboratory were significantly higher than for those held in the field (df = 1, F = 4.11, P = 0.04), primarily due to the fact that the PIT-tagged fish in the laboratory were larger than those held in the field. However, starting weights were not significantly different between tag and control treatment groups (df = 1, F = 3.72, P = 0.06). Fish in the field took longer to heal completely than those held in the laboratory (Fig. 3). At 15 days after surgery, six of 32 laboratory fish had completely healed but none of the 63 field fish had completely healed (χ 2 = 20.99, P < 0.001). There was also greater variability in healing at this point than we observed for fish held in the field (Fig. 3). After 51 days, 91% of the laboratory fish had healed, but 38% of field fish still showed incomplete healing (χ 2 = 23.39, P < 0.001). All fish showed complete healing by 21 February (88 days after tagging). Fish that had not healed completely after 2 weeks often exhibited redness at the incision area (Fig. 1), internal infection near the tag, and/or external fungal infection at the incision site. In many fish that healed completely, the tag shifted to a more posterior position, and there was no sign of tissue adhesion to the tag. There was also no sign that the tag obstructed dorsal aorta blood flow, as noted by Dawson et al. .
Ammocoete survival and PIT retention were high at both facilities. Of the 65 PIT-tagged ammocoetes held in the field, two (3%) died and one lost its tag (2%) in the 51 days after tagging. Mortalities were 108 and 121 mm TL at the time of tagging. One of the mortalities was tagged in the ventral location, and there was evidence of internal damage to the intestine. In the control group, we noted loss of two VIE marks during the first 51 days after tagging. Starting 181 days after tagging, a large number of tagged and control animals were missing at the field site on several assessment dates. Extensive searching produced no tags or bodies, suggesting that the lamprey escaped their chamber (as in [9, 21]). For PIT-tagged ammocoetes held at the laboratory (n = 34), two died (6%) in the first week and one lost its tag (3%) within 51 days. The tag loss and one of the mortalities were probably due to incorrect PIT placement, with implantation in the musculature rather than in the body cavity (i.e., during implantation the incision did not penetrate the body wall completely). The remaining mortality (131 mm) was tagged in a ventral location, and necropsy revealed damage to the intestine. Of the seven controls in the laboratory, one died (127 mm) after a few days and one lost its VIE mark after 1 month. At both laboratory and field sites, larval lamprey held for 88 days (late November to late February) consistently lost weight and decreased in length (mean = −0.07%/day). Analysis of covariance indicated that there was no significant difference in specific growth rate (in this case weight loss) between control and PIT-tagged fish at either the laboratory (df = 1, F = 1.17, P = 0.29) or the field site (df = 1, F = 0.21, P = 0.65). Starting weight also had no significant effect on specific growth rates recorded at the laboratory (df = 1, F = 3.34, P = 0.08) or in the field (df = 1, F = 0.48, P = 0.49). The range in individual weight loss over the 88-day holding period in the laboratory was 0.08–0.2%/day for controls and 0.07–0.2%/day for tagged fish. In the field, some fish exhibited weight gain over the 88-day period, with growth ranging from −1.1 to +0.1%/day for controls and from −0.4 to +0.2%/day for tagged fish. For most trials, ammocoetes were unable to swim against the relatively slow water velocities we tested (5, 6, and 7 cm/s) for more than 15 min (Fig. 4). Typically, an individual was able to swim for a longer time in the first trial than in subsequent trials, but analysis of covariance indicated that this was not statistically significant (df = 1, F = 3.46, P = 0.07). Time of sustained swimming for the controls (n = 8) was not significantly different (df = 1, F = 0.06, P = 0.80) from that of PIT-tagged larvae (n = 15). Not surprisingly, analysis of covariance indicated that time of sustained swimming diminished significantly with increasing water velocity (df = 2, F = 9.33, P = 0.0005) and decreasing fish weight (df = 1, F = 4.31, P = 0.04), regardless of tag treatment. There was no significant difference (P = 0.20) between the lengths of PIT-tagged (mean = 104.6 mm, SD = 12.8) and control (mean = 97.6 mm, SD = 11.5) ammocoetes. Mean Ucrit was computed for five individuals (79–119 mm in length) and ranged from 5.0 to 6.7 cm/s (0.47–0.83 body lengths/s). The smallest PIT tag currently available (8.4 mm) can be used to tag larval Pacific lamprey with high fish survival and tag retention. Survival was 96% (similar to the 95% survival observed for controls) and tag loss was only 2% during our 10-month study. The smallest fish we tagged was 71 mm. In contrast to Dawson et al. , we found no evidence that fish size at tagging affected survival or tag loss; the only fish that died were longer than 100 mm. The mortalities and tag loss we observed were more likely due to incorrect placement of the tag: either in the lamprey musculature rather than into the body cavity, or placement that was too low in the body cavity (ventrally tagged) and resulted in damage to the intestines (as reported by ). The relative success with larval Pacific lamprey (compared to sea lamprey) was probably due to differences in tagging methods, as opposed to species-specific differences. Even though the mean size of ammocoetes we tagged was smaller than those used in previous studies [8–10], both survival and tag retention we observed were substantially higher than reported for the same tag in sea lamprey ammocoetes (40% survival and 5% tag loss ). Unlike earlier studies, we employed a lateral tag placement and did not attempt to close the incision with sutures. Use of a ventral incision often results in damage to the intestine and occlusion of blood flow [9, 10]. The few ammocoetes that we tagged using a ventral incision exhibited high mortality (10%) and damage to internal organs relative to fish with a lateral incision completely into the body cavity (1%). Hence, we recommend a lateral incision for this life stage, and that care is taken to insure that the incision completely penetrates the body wall. The stage of ammocoete development may also affect tagging success. Earlier studies have used sea lamprey that were close to metamorphosis [7, 9, 10], while most of the fish we examined were likely at least 1 year from the onset of metamorphosis. Lamprey experience a dramatic reorganization of tissue during the year of metamorphosis . Both the stress associated with this transition and changes in organ position may complicate tagging of lamprey that are starting to transform. For example, while we had the greatest success with a lateral incision on Pacific lamprey ammocoetes, other researchers using fully metamorphosed Pacific lamprey have successfully used a ventral incision [12, 13]. One of the largest ammocoetes we tagged in late November 2013 successfully metamorphosed by December 2015, indicating that metamorphosis can proceed in lamprey bearing a PIT tag. Almeida et al. also observed successful transformation of sea lamprey tagged as ammocoetes. PIT tag retention and healing rates were high, even though no attempt was made to close the surgical incision in this study. In adult lamprey, the presence of sutures can actually delay healing , and adults are routinely PIT-tagged without closing the incision . We observed that wound closure could occur within 2 weeks for lamprey held in the laboratory at 14 °C, but that healing rates were quite variable among individuals. However, lamprey held in the field at ambient winter water temperatures (<11 °C) required longer to completely heal (2–3 months). These fish were also probably exposed to more pathogens. Fish held in the field were somewhat smaller than those in the laboratory, which may have contributed to their slower healing rates. Nevertheless, all of them eventually healed and did not lose their tags in spite of the protracted healing period and activity associated with burrowing. PIT tags were retained as well or better than VIE marks injected subcutaneously. While sample size was low (n = 20), we found that 15% of VIE marks lasted no longer than 2 months. This was similar to VIE mark loss rates recorded for non-transforming Pacific lamprey ammocoetes tagged in previous studies with similar materials (13% in ; 9% in ). Potts  reported a 38% rate of VIE mark loss for sea lamprey within the first 22 days after tagging. The ammocoetes seemed to be sensitive to damage to musculature, and if the VIE mark implant was inserted too deep, it resulted in inflammation, or in one case, death. However, after the initial VIE mark loss and mortality, these tags were retained in ammocoetes that we observed in the laboratory for over 2 years. Silver et al. also reported excellent long-term retention of VIE marks. While specific growth rate of ammocoetes did not differ between tagged and untagged treatments, we observed consistent reductions in size (both length and weight) over the course of only 3 months. This was observed in both the laboratory (supplemental feed) and the field, where natural spring water likely contained some food particles (as reported in ). Similar initial decreases in size were reported by McGree et al. for Pacific lamprey held long term in the laboratory with ambient stream water, both with and without supplemental feed. A field study by Johnson et al. indicated an initial reduction in length during the first 8–13 months for sea lamprey ammocoetes tagged with coded wire compared to untagged fish. However, 30 months after tagging they reported that the length distributions for tagged and untagged fish were not different. The PIT tags allowed us to examine individual growth, which varied greatly and was not related to starting weight. Mesa et al. also reported extremely variable growth of transformed Pacific lamprey bearing PIT tags that were held in the laboratory for an extended period. This suggests that, as is the case for many species held in captivity, individual lamprey compete differentially for limited food resources. Unlike many teleosts, the largest lamprey in our study were not always the ones that exhibited positive growth. It is possible that the larger lamprey were starting to reduce feeding in preparation for metamorphosis . Indeed, one individual was observed to metamorphose 2 years after our study was started. Johnson et al. found that sea lamprey bearing coded wire tags were actually more likely to metamorphose than untagged animals. Swimming performance was poor for both PIT-tagged and control groups. The ammocoetes we tested were able to sustain swimming for only a few minutes at very low water velocities (<7 cm/s), but tagging did not diminish swimming capacity. Mueller et al. also found no effect of PIT tagging on performance of transformed Pacific lamprey, but the metamorphosed fish were able to sustain much higher swim speeds, swimming for over 20 min at speeds up to 30 cm/s. Suthpin and Heuth  tested larval Pacific lamprey similar in length to those we tested and they recorded swim durations of <10 min at water velocities over 30 cm/s. In their tests, ammocoetes were held at higher water temperature (20 °C) and were only in captivity for <1 week. In contrast, we tested larvae at 16 °C and after 9 months in captivity. Both of these conditions may have reduced the swim performance observed in our tests . Very small (70–120 mm) larval lamprey can be safely tagged with 8.4-mm PIT tags, permitting identification of individuals. This is an exciting step toward gaining data on this life stage in the wild. Basic biological information, such as individual growth rates, timing of metamorphosis, and movements, can be obtained using these uniquely coded tags. Quintella et al. and Dawson et al. were able to detect PIT-tagged sea lamprey larvae released in a natural stream setting. While sample size was limited, these studies provided valuable information on the timing, direction, and distance that larval lamprey move in their natural habitat. Our field and laboratory observations of growth provide initial insight into individual variation that may or may not be the product of artificial holding. In addition, PIT tagging of ammocoetes will potentially allow documentation of losses to impingement or entrainment in water abstraction schemes, passage rates through various routes at dams and other barriers to movement, and losses to avian or piscine predators (reviewed in ). The successful conservation and restoration of imperiled lampreys worldwide, as well as control of invasive sea lamprey in the Laurentian Great Lakes, will undoubtedly benefit from use of these new transponders. MLM, ADJ, and RPM designed the survival, growth, tag retention, and swimming trial experiments. MLM, RPM, and MD conducted the swimming performance tests and collected data. ANM conducted fish growth and healing assessments and maintained animals in the laboratory. ADJ conducted fish growth and healing assessments and maintained animals in the field. MLM analyzed data and prepared the manuscript with assistance from ANM. All authors provided critiques of the research and contributed to the manuscript review. All authors read and approved the final manuscript. We would like to extend our appreciation to staff of the Confederated Tribes of the Umatilla Indian Reservation, in particular, Tony Montoya, Kanim Moses-Conner, Brandon Treloar, Jerrid Weaskus, Jeremy Wolf, and Shaina Zollman for collection, assessment, and maintenance of fish during this study, and Julie Burke, Celeste Reves, Dora Sigo, and Gary James for administrative support. In addition, we thank Ralph Lampman and Patrick Luke from the Yakama Nation Fisheries Program and Gordon Axel, Jesse Lamb, and Matt Nesbit from the National Marine Fisheries Service (NMFS) Pasco Research Station for assisting with tagging of the larvae. Justin Pearson and staff at the Water and Environment Center and Pacific Northwest National Laboratories helped with fish maintenance. Funding was provided by the Bonneville Power Administration (BPA) and United States Bureau of Reclamation (BOR). We thank Debbie Docherty (BPA) and Sue Camp (BOR) for administrative support, along with the team at NMFS: Sandy Downing, Doug Dey, Mary Nolting, Andrianna Jutt, Ruth Tajon, Sandra Metzger, and JoAnne Butzerin. The datasets created and analyzed during the current study are available from the corresponding author on reasonable request. Fish care and protocols for fish holding, surgery, and tagging were approved by the U.S. Geological Survey Animal Care and Use Committee in accordance with U.S. Geological Survey Institutional Animal Care and Use Committee Permit 2008-26. Swim tests were conducted using the “Routine care and maintenance of general aquatic laboratory fish stocks” protocol maintained by the Association for Assessment and Accreditation of Laboratory Animal Care International. This work was supported by funding from the U.S. Bureau of Reclamation and the Bonneville Power Administration (ADJ, ANM, MLM). An Alternative Sponsored Fellowship from the Confederated Tribes of the Colville Indian Reservation supported MD and RPM received support from PNNL. Potts DD. Investigating new methods to improve aging and study movement patterns of larval Great Lakes sea lamprey (Petromyzon marinus) populations [master’s thesis]. Flint: University of Michigan; 2012. doi:10.3996/102013-JFWM-067.S9. United States Fish and Wildlife Service. Fisheries resources: Pacific lamprey conservation initiative website. 2015. http://www.fws.gov/pacific/Fisheries/sphabcon/Lamprey/index.cfm. Accessed 20 May 2016.